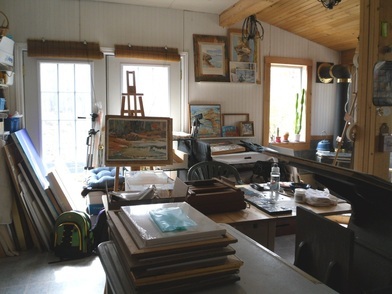 Workshops take place at Dragonfly Ridge Studio and out on location at sites on the Bruce Peninsula and at Santa Fe Gallery in Owen Sound. Watercolour workshops are with Lin Souliere, award winner at the 2007 Canadian Society of Artists in Water Colour Annual Exhibit, and First Prize Award Winner at 2008 Bruce County Juried Exhibit. Lin was also elected as a full member to the CSPWC in 2011 and is currently the Regional Director for Central Ontario for the CSPWC. Lin's approach to watercolour includes: importance of composition, know your colours and what they can do, and put yourself into your work. "Copying someone else's style does not allow your own unique style to grow. I will show you the path, but you must walk beside me, not behind me. All of us has something valid to express and watercolour is the perfect medium to do this. Learn to look at the light, see the subject and discover the message. For my own work, light and glowing colour help me create compositions that speak of my connection with nature and spirit. 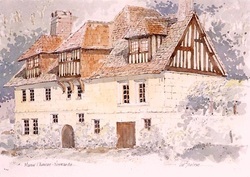 My techniques include pouring of watercolours, glazing, and traditional brush work, and using negative space to create strong composition. I build my paintings in layers, using a lot of texture and colour to give depth. " We are back from France and what a blast! A great group of painters to travel with. Workshop for 2015 - Painting in Portugal - Done! It was a great experience. A great group of artists. September 12 to 24, 2014 with an optional 3 nights extra in Rome. DONE! At this time, I have decided I will no longer be offering any watercolour classes or workshops.